No endorsements yet – Candidates include Faith VanderHorst, Michele Divelbiss, Lowell Kellogg, Stephen Roberts and Michael Vettor. We will support candidates who will publicly oppose the referendum. Bradley Matthiesen is running unopposed. As such, no endorsement is necessary in this race. There will be a school board candidate forum on Wednesday March 23. Here is a link to the flyer. Unfortunately questions needed to be submitted by the 18th so it’s too late for that but I know that these forums are usually televised. In the meantime, I’m going to try to find email contacts for the candidates and just outright ask them. Kellogg is a no-go for me. 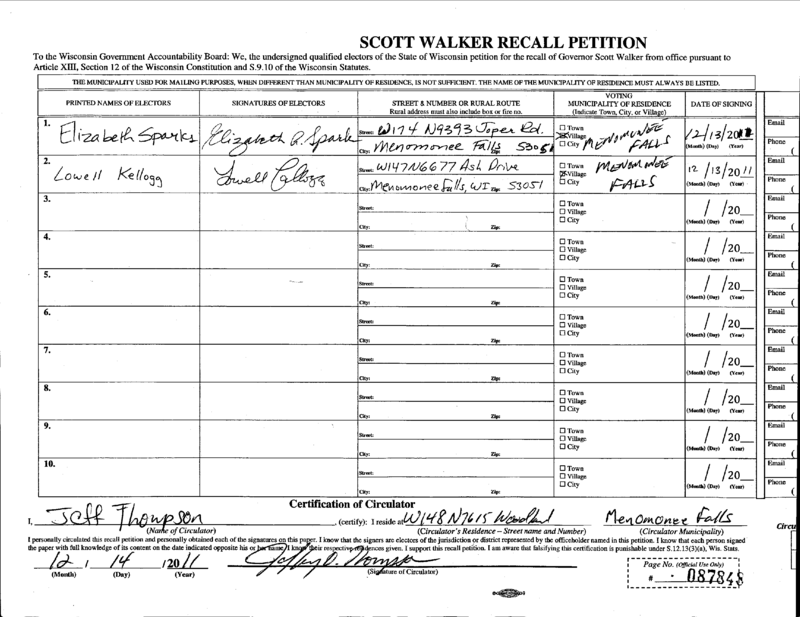 He signed the Walker recall petition. Have not heard back from Divelbiss yet. Vanderhort called me which is a point in her favor. She DOES support the referendums however. I am still trying to find contact information for Roberts and Vettor. You would think it would be easy to find contact information for a person running for an office wouldn’t you? Roberts is not on my ballot for some reason however everything I read says he is running. Anyone know why that is? Divelbiss responded to my email and said that she WOULD be voting YES on the referendum questions. I hope the information is helpful. Will post if I manage to contact the other two. May be of interest. I have emailed Mr. Vettor. According to the above article Mr. Roberts was deemed inelligible to run by the GAB so that is why he does not appear on the ballot. Of the others, Kellog signed the Walker recall, both Divelbiss and Vanderhort support the school referendum. Will post here if I receive a response from Mr. Vettor. Spoke with Mr. Vettor this morning. He also is supporting both of the referendums. It seems no one who is running is opposed. With the board in the pocket of the administration there is no hope for reasonable oversight. If this wasteful spending is allowed our school district is doomed and Menomonee Falls can no longer claim to be conservative. I agree. Mark Belling did another short segment on this yesterday afternoon. The district has been hitting this really hard with public forums, mailings etc. Hopefully the voters did their homework.